I just finished watching the first episode in the new BBC Horizon series, it was entitled “Do You See What I See“. It was interesting but at the same time disappointing. I would summarise the subject matter in general terms as What you perceive is subjective, what actually exists is objective. In this episode they talk about colour, but it can be equally applied to light/dark, pain, temperature, taste, loudness/quietness etc. One thing I didn’t like was when Dr Beau Lotto makes statements like: colour is an illusion, colour doesn’t exist. Ok, it’s a popular science program not an academic conference, but FFS get the simple things right and be clear about them. If you want to assert that each individuals perception of colour is different – that’s fine. If you want to say that colour is a human construct of language that describes a perception – that’s fine. But be clear about what your saying. Assertions like colour doesn’t exist can only be designed as headline-seeking-soundbytes, and they do a disservice to science and otherwise respected programmes like Horizon, imho. In Physics we tend to be quite specific when we talk about colour, i.e. we talk about the wavelength of electromagnetic radiation. 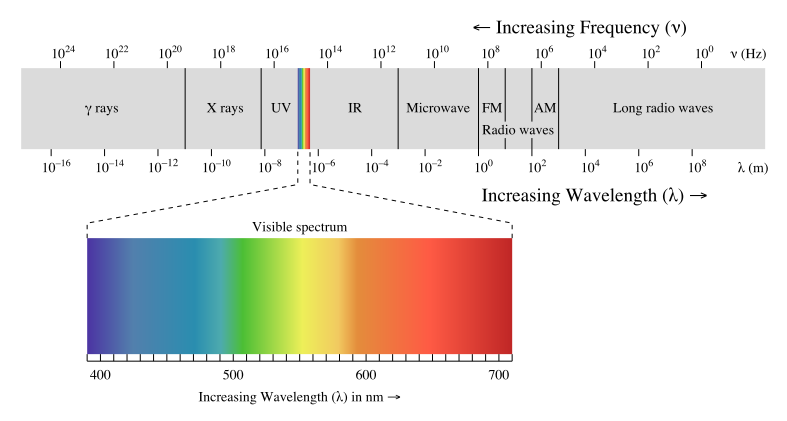 The electromagnetic spectrum includes visible light, x-rays, radio-waves, microwaves, etc. We use wavelength of EM spectrum because it is objective, observable, measurable, and reproducible; whereas colour perception is purely subjective. We use equipment to measure the wavelength and it has a number not a name. So while we can say Sodium burns with an orange glow, it’ll be backed up with a wavelength such as 589 nanometers (and include a stated margin of error depending on equipment used). But there were interesting parts too. The effect of language on colour was fascinating, and this was brilliantly demonstrated with a piece on the Himba tribe of Northern Namibia. They classify colours in a different manner to most Westerners and have only about half the (names for) colours we use. So they say milk is white, but they also consider water as white – we’d consider it transparent (or blue according to the programme). But the most interesting part was where the Himba couldn’t easily discern between certain shades of blue/green – which would be easy for Westerners; but conversely there were shades of brown/green they could easily discern which Westerners struggle to discern. I’ve also noted that children (Western and presumably all children) will describe water as white – until they’re told it’s transparent (or blue if that’s what some people call it). Other interesting aspects of colour included how our perception of colour is effected by the surrounding colours, by colours we’ve just been looking at, by age, gender, etc. There are countless optical illusions (google it) that brilliantly demonstrate, imho, what we see is a subjective perception; the reality in the external world is an independent objective reality. This episode was a good start to the Horizon series, which itself is a stalwart well worth a series-record. Go Horizon! As always, feel free to comment, tweet, like, +1 etc. This entry was posted in Documentary, Physics, Reviews, Science and tagged BBC Horizon, Do You See What I See, Horizon. Bookmark the permalink. I would have liked to watch this programme, but I found the background “music” so irritating, that I switched off after about 15 minutes. This unnecessary plinky plonky electronic music has become more and more invasive in so many TV programmes, so that I wonder if “do you hear what I hear?”. I will try to watch the subsequent programmes but if they have a similar background, I shall have no hesitation in turning off – and wait for the book to come out!